Can Bruce Arians save the sinking ship? Bruce Arians talks about his plans as the head coach of the Tampa Bay Buccaneers. Another year, another disappointing season for the Tampa Bay Buccaneers, and now a new coach. Can he save the ship that has been sinking for so many years? Bruce Arians, one of the most well-respected minds in the NFL, was lured out of retirement to be the next head coach of the Buccaneers. Many may wonder, including me, how the Bucs, a team that has been in the trenches for most of recent memory, could land such a well-known and successful coach. It could be Arian’s friendship with the current Bucs general manager, Jason Licht, or on the other hand it could be his admiration and respect for Jameis Winston, the Bucs quarterback. Licht and Arians spent the 2013 season together in Arizona, a season which saw the Cardinals go 10-6 and just barely miss the playoffs. This kickstarted their relationship, which has been followed with years of personal communication, and now a reunion in Tampa Bay. As for Jameis, Arians has stated that “[h]is willingness to work is unbelievable. He’s in the office at 5 o’clock in the morning,…there’s no doubt the whole thing is going to be built around him.” He loves his work ethic and of course his natural ability that has led to Winston having some of the most prolific passing statistics in the beginning of any quarterback’s career. Arians and Winston’s relationship, however, goes back much farther than just recently. When Winston was in middle school, he attended a football camp that was directed by Arians, which began their relationship and actually gave Winston his first dream of winning a Super Bowl. Arians brought his Super Bowl ring and showed the campers. Winston has said recently, after playing against Arians two years ago in Arizona, that this act made him want to get one of those rings for himself. Arians’ relationships with both Licht and Winston should hint at success for the Bucs future, at least, that is what all Bucs fans are hoping for. There is another major reason that Arians decided to come out of retirement and coach a team that was not named the Cleveland Browns, who he had previously said would be the only team he would coach. Almost all of Arians’ past assistants and coordinators from his Arizona days became available this offseason, including Todd Bowles, the former head coach of the Jets and defensive coordinator of the Cardinals, and former offensive coordinator of the Cardinals, Byron Leftwich. Both have been hired to come on board with the Bucs, Bowles being the defensive coordinator and Leftwich being the offensive coordinator. Also, Harold Goodwin, Kevin Ross, and Nick Rapone, all former Cardinal assistants, have been hired to join the Bucs. The franchise is going all in on the relationships of a past successful staff that needs to pull the success out of a very talented roster of players. 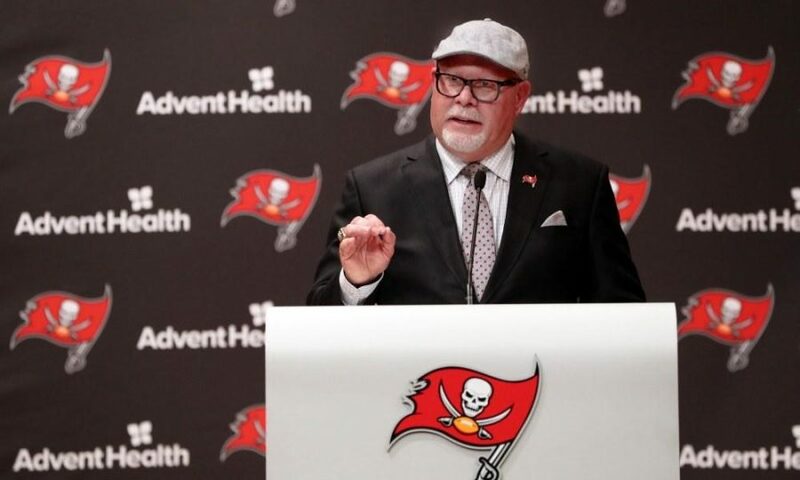 Bruce Arians needs to be the savior of the Bucs, or the franchise will sink deeper into the depths of the NFL. This coaching change will either mean a very successful future, or hitting rock bottom again, just a few years after having the first overall pick. Failure would mean moving on from Jameis Winston, and the abundant amount of raw talent the team has and starting yet another rebuild. Bucs fans just need to continue hoping that the Bucs have finally found a way to fire the cannons consistently and siege a Super Bowl in the near future.